Each Growing Places classroom is an active learning community – developmentally appropriate, fun and educational. Growing Places provides loving, safe, and engaging environments for children to explore through play in the company of responsive and interactive adults. Knowing that children learn at different rates, teachers intentionally plan curriculum based on individual observations and assessments. A wide variety of enriching opportunities are designed to support children’s cognitive, social-emotional, language, and physical development. Teachers extend children’s learning by asking open-ended, thought provoking questions. Children’s development is documented through child assessments and portfolios. 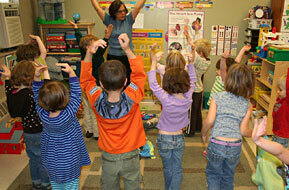 Teachers in all classrooms use sign language as a means to promote early literacy skills. Music, dramatic play, and storytelling are also cornerstones of our program. We value the importance of outside play. Teachers provide a balance of time for exploration as well as more structured activities that promote physical development, curiosity, and investigation of the natural environment. Learn more about our programs by clicking below or contact us to schedule a tour of our facilities. This program meets the unique needs of the very young child. In our loving, responsive and engaging environment, children explore, develop and thrive. Learn more about our Infant/Toddler Program. Children learn through play in an environment that is active and engaging. Learn more about our Pre-School Program. The Pre-Kindergarten Program is designed to meet the needs of children ages 4-6. Social and group skills are refined as children work individually and in small groups. Learn more about our Pre-Kindergarten Program. After a structured full day of school, “Our Time” provides children with a wide variety of quiet and active activities to choose from. Learn more about “Our-Time” After School Program. Our two summer day camps for children ages 5 – 12 years keep children safe, active and engaged while enjoying seasonal summer activities with qualified, caring adults and small group sizes. Learn more about our School-Age Summer Camp Program.